The Grand Prize in the Automotive – Chassis Category went to Keystone Powdered Metal Co for a rake cam, left-hand inner cam, retainer guide, right-hand rake teeth energy-absorbing eccentric strap cam, column mounting insert teeth, and left-hand rake teeth, part of the steering column in the Chevrolet Colorado and GMC Canyon trucks. The Metal Powder Industries Federation (MPIF) has announced the winners of its 2016 Powder Metallurgy Design Excellence Awards. Fourteen winners – four Grand-Prize winners and ten Awards of Distinction – were congratulated during POWDERMET2016. The Grand Prize in the Automotive – Transmission Category was awarded to GKN Sinter Metals for five components – a side gear, two pinion gears, a locking side gear, and a locking plate – comprising a forged PM electronic locking differential gear set made for Ford Motor Company. The parts go into the rear axle differential of the Ford F-150 light truck, the first time forged powder metal differential gears have been used in such an application. The higher performance delivered by the forged PM differential gears compared to that of competing metal-forming processes will help usher in downsized gear systems, satisfying a critical need in future automotive design. The Grand Prize in the Automotive – Chassis Category went to Keystone Powdered Metal Co for seven components – rake cam, left-hand inner cam, retainer guide, right-hand rake teeth energy-absorbing eccentric strap cam, column mounting insert teeth, and left-hand rake teeth – made for its customer Nexteer Automotive. The heat-treated diffusion-alloyed steel components are all part of the steering column in the Chevrolet Colorado and GMC Canyon trucks. They’re key elements of the column’s tilt and telescope adjustment feature, serving a vital role in maintaining the column’s position during a crash event. The rake cam 2 has features that allow for a mechanical lock of the plastic lever, which is overmolded in an operation performed by Agapé Plastics Inc. The Grand Prize in the Aerospace/Military Category was won by Advanced Forming Technology, an ARC Group Worldwide Company, for a front sight base. The MIM-4605 low-alloy steel part is used on the AR-15 rifle. The front sight base, made by metal injection molding (MIM), is much larger than the typical MIM part and has a complex geometry. The switch from a part machined from bar stock to the MIM part yielded savings of more than 30%. 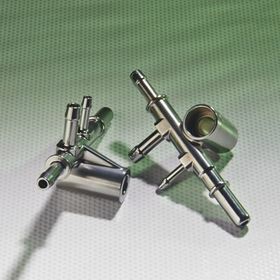 The Grand Prize in the Medical/Dental Category was won by Parmatech Corporation for four stainless steel MIM components – articulation lock bar, articulation connector, articulation drive block, and knife guide – used in an articulating endoscopic surgical device designed specifically for thoracic surgery. All the parts feature complex 3D geometry, including the features on the articulation connector, that would be extremely difficult to machine. These are designed-for-PM parts, saving an estimated 70% over machining them. The ability of the MIM process to produce parts of different alloys with tight tolerances enabled the design of a smaller endoscopic device, a critical benefit in thoracic surgery. The Award of Distinction in the Lawn & Garden/Off-Highway Category was given to Indo-US MIM Tec Pvt Ltd for a MIM 17-4 PH stainless steel diesel leak-off union made for Lombardini. The Award of Distinction in the Automotive – Engine Category was given to Cloyes Gear & Products, Inc, a division of HHI/MPG for three steel sprockets made for Iwis Engine Systems LP. The components, a rubberized crankshaft sprocket and two rubberized oil pump sprockets go into a General Motors Generation II High-Feature V-6 Engine, currently installed in the Cadillac CT6 and ATS, GMC Acadia, and Chevrolet Camaro. The patented rubber design used on the crankshaft sprocket provides improved noise, vibration, and harshness characteristics that exceed the engine manufacturer’s demands. Fabrication via PM provides an estimated 30% savings over parts machined from steel bar or forgings. An Award of Distinction in the Automotive – Chassis Category went to Capstan, for a drive pulley for an electronic power steering system. The iron–copper part goes into assemblies found in the Ford Focus and Escape vehicle platforms. This six level component requires tight tool-wear control. PM was chosen as the fabrication method because it offered far better precision than the die-cast alternative at a competitive price. Another Award of Distinction in the Automotive – Chassis Category was won by GKN Sinter Metals for a copper–steel driven pulley for an electric power steering system made for Nexteer Automotive. The pulley is a complex net-shape-compacted part with a unique helical geometry and tight tolerances. 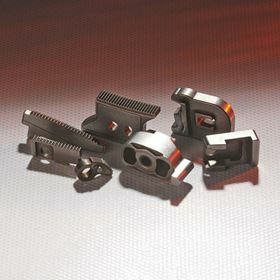 Close collaboration with the customer in the design of the part, which includes net-formed lightening holes, yielded savings of more than 10%. The Award of Distinction in the Lawn & Garden/Off-Highway Category was given to Indo-US MIM Tec Pvt Ltd for a MIM 17-4 PH stainless steel diesel leak-off union made for Lombardini. The part goes into the fuel injection of a line of Kohler diesel engines that are assembled in JCB MIDI and mini excavators, compact wheeled loaders, and Teletruk forklifts. A conversion from a previously used plastic part, whose performance suffered in the tough working environment and load/vibrations in the field, the MIM part delivered savings of around 10% through improved quality. The Award of Distinction in the Aerospace/Military Category goes to Advanced Forming Technology, an ARC Group Worldwide Company, for a MIM 17-4 PH stainless steel ferrule that goes into an aerospace engine made by its customer Rolls-Royce. The part provides a conductive path between the screen and the engine, while offering support to the single cable and preventing the placement of cable loading on the screen. The component, with its’ complex geometry, is sintered exactly to net shape, with no secondary operations needed to meet required dimensional specifications. Cost savings were the primary driver for the switch to a MIM part from one machined from bar stock. The Award of Distinction in the Hand Tools/Recreation Category was given to Parmatech Corporation for a MIM 4605 low-alloy steel trigger. The part goes into an adjustable trigger system on a pump-action shotgun. The complex part geometry, which features multiple thickness changes and slots, required precise tooling to address sufficient machine stock for effective secondary operations. The MIM trigger delivers savings of around 50% over the machined version it replaced. An Award of Distinction in the Electronic/Electrical Category was earned by Indo-US MIM Tec Pvt Ltd for three parts – a mirror cover, a base, and a middle – made for Optosense. Molded from MIM-316L stainless steel, the parts are assembled into an infrared gas sensor for methane and carbon dioxide detection that has extremely low power consumption. A new application designed specifically for the MIM process, these are medium complexity parts that have an esthetic requirement on a few reflective surfaces. Another Award of Distinction in the Electronic/Electrical Category went to GKN Sinter Metals for an aluminum PM heat sink made for Visteon. The part is used in a high-volume global automotive stereo application. The part is produced to net shape with no secondary machining operations needed. The high material ductility of the special aluminum PM alloy, combined with the precise positioning of the tooled-in assembly holes, enables assembly of the heat sink without the need for attachment screws. An Award of Distinction in the Medical/Dental Category went to Flomet, LLC, an ARC Group Worldwide Company, for a MIM tungsten electrode used in a surgical ablation device that uses high temperature for the removal of tissue. The use of tungsten enables the electrode to reach its operating/effective temperature more efficiently and maintain it for a longer time than with other alloys. Another Award of Distinction in the Medical/Dental Category was given to Advanced Forming Technology, an ARC Group Worldwide Company, for a MIM wedge blank used in an endoscopic staple gun. Made from a MIM-440 stainless steel, the part has a complex and very small geometry that pushed the MIM process to the very limits of tolerance capabilities. The part’s 5 mm diameter size, less than half the previous low of 12 mm, enables new procedures to be created and enhances procedures in smaller patients, particularly in the area of pediatrics.